Montalvo Arts Center | News | Save the Date for Arts Splash! 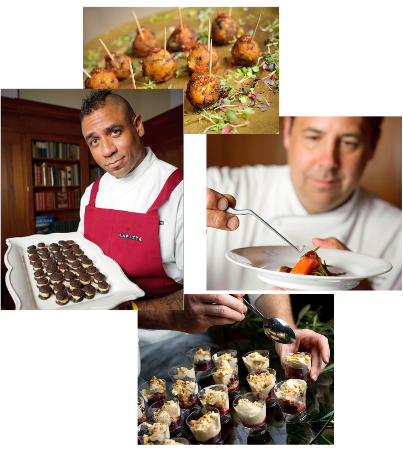 April 21 and Food & Wine June 3 - plus more news! 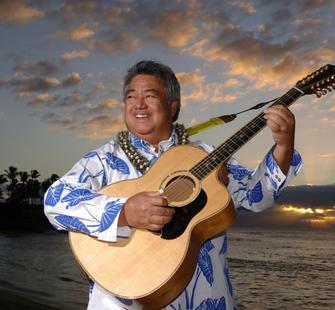 George Kahumoku Jr and Masters of Hawaiian Music - SOLD OUT! Circle Saturday, April 21 on your calendar! 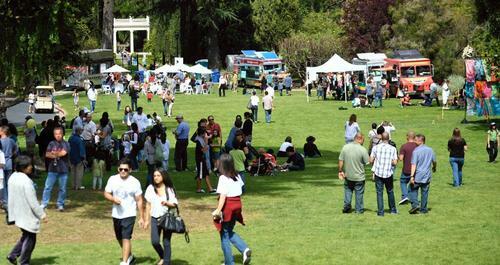 From 11am-4pm, Montalvo will open its doors to the community for a fun day of art, performances, gourmet food trucks, birthday cake, and more as we celebrate our 3rd annual Arts Splash! Open House & Student Arts Festival and kick off our 2012 Centennial celebration. Featuring performances and works of art by over a dozen student groups, face painting and arts activities for kids, a live DJ, artists-in-residence showcasing their work, a spring plant sale, and Montalvo's beautiful grounds, gardens, and historic Villa open for exploring, this is one event you won't want to miss! 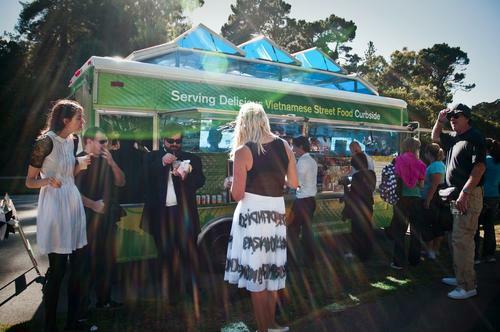 Guests gather at Little Green Cyclo's food truck during last year's Arts Splash! Be sure to follow @montalvoarts on Twitter and stay involved by using #ArtsSplash. Take some photos and submit them during the day to our on-location photo contest (details pending) so that we can see what you're seeing. And don't forget to RSVP to Arts Splash! on our Facebook Event Page and invite your friends to join the fun! If you're a fan of jazz, you won't want to miss the Kyle Eastwood Band on Friday, April 6, at 8pm, in the intimate Carriage House Theatre. Eastwood is an accomplished musician and composer and the son of actor Clint Eastwood. He's a master of the bass guitar, and his album Paris Blue topped the European jazz charts. Take a look at the video above, then purchase your tickets today! For a full list of upcoming concerts at Montalvo, click here. Tickets are always available online through Ticketmaster, or by calling the Box Office at 408-961-5858 10am-4pm Mon-Fri.
Members: Join us for a reception before George Kahumoku, Jr. The performance this Sunday, March 11, at 7:30pm, by George Kahumoku, Jr. & the Masters of Hawaiian Music is SOLD OUT. If you are a Montalvo Member and you have tickets, you're invited to a special reception before the concert. Join us in the Phelan Library from 6:30-7:30 for wine and cheese and a chance to mingle with your fellow Members! If you're not a Member, this is one of the many great benefits you can receive by joining! Read more about Montalvo Membership and register online - or contact our Membership Department at 408-961-5849 to join today. Save the date for Sunday, June 3, from 5:30-8:30pm, for our 9th annual Food & Wine Classic! The historic Villa	will	be	transformed	into	a	food	and	wine	lover's	paradise as we feature	20	of	the	best	chefs	and	restaurants	in	California,	along	with	22	of	the	region's finest	wineries. Chat with the chefs	and	winemakers as	they	prepare	and	serve	their	unique creations, and bid	on limited	edition	wines	and	special travel	packages during	the live	and	silent	auctions. Participating restaurants: The Ahwahnee In Yosemite, Arka, Bistro Moulin, Chez TJ, Cin-Cin Restaurant, Dolce Bella Chocolates, Farallon, Flea Street Cafe, Kokkari, Lafitte, Le Papillon, Madera, Manresa, Montalvo Culinary Fellow Niki Ford, Navio, Plumed Horse, Sent Sovi, Taste Catering, Viognier, and Whole Foods Market Los Gatos. Participating wineries: Bernardus Winery, Cooper-Garrod Estate Vineyards, Domain Eden, Faust, Grgich Hills Estate, House Family Winery, J. Lohr Vineyards & Wines, Joyce Vineyards, Kathryn Kennedy Winery, Oakville Ranch, PasoPort Wine Co., Pride Mountain Vineyards, Ridge Vineyards, Sojourn Cellars, Tablas Creek Vineyard, Talbott Vineyards, Testarossa Winery, Thomas Fogerty, Silver Oak, and Twomey Cellars. Tickets to this delicious evening are $175 ($125 is tax-deductible), or $150 for Members ($100 is tax-deductible). Only 425 tickets will be available, so reserve early! Purchase through the Box Office at 408-961-5858 10am-4pm Monday-Friday. Lead event sponsors: Mark Jon Bluth, Bill Gorman Real Estate, San Jose Business Journal, Asset Management Company, Carol Jeans-Sereno Group, Classic Party Rentals, and Union Bank. March 30: Final Fridays with Robin Lasser, plus a special dinner & movie event! On Friday, March 30, at 6pm, join us in the Lucas Artists Residency Commons for a special Final Fridays with Robin Lasser, followed by dinner and a movie! Lasser, a multidisciplinary artist and professor at San Jose State University, will be installing one of her amazing Dress Tents on Montalvo's grounds this spring. For Final Fridays, she will discuss her work and the plan for her piece at Montalvo. After Lasser's presentation, guests are invited to remain in the Commons for a casual dinner and movie! The movie follows a project called Vorratskammer, a 15-month-long endeavor to feed 5,000 people in five days. 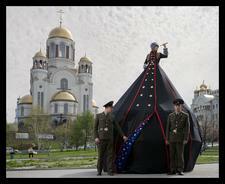 The project is the work of artists-in-residence Wapke Feenstra and Antje Schiffers. Meanwhile, culinary Fellow Niki Ford will prepare giant Muffuletta-inspired sandwiches, salad, and cookies for a casual meal to enjoy during the screening (dinner is $15). Those who don't want dinner can still relax, watch the film, and enjoy a glass of beer or wine! This is a FREE event. Cash payment for dinner ($15) will be taken on-site (limited to 30 patrons); RSVPs must be made through Julie Thorne at jthorne@montalvoarts.org. Please include any dietary restrictions in your email. Summer Camps - On sale now!